This month we're trying our hand at homemade puff pastry. Gotta tell you I've done this before and everyone should try it at least once, but I now have no problem spending the extra money for Pepperidge Farm to do it for me. This recipe is suggested by Sangeetha Priya of Nitha Kitchen. She made homemade spinach pinwheels, but I am just not into spinach that much so I changed mine to a sweet pastry - APRICOT PINEAPPLE DANISH. You can make the pastry a day before and store in refrigerator or freeze it for longer use!!! Sift the flour and salt into a large bowl. Make a well in the flour and pour in about two-thirds of the cold water, mixing until you have a firm rough dough adding extra water if needed. You can use food processor/blender at this time. Turn out onto a lightly floured board, knead gently and form into a smooth rectangle. Cover with cling film and leave to rest for at least 20 mins in the fridge. Overnight works too. Roughly break the butter in small chunks, use two parchment paper and chunk them loosely. You need to see bits of butter. Using Knife or scale and bring it to shape and store in refrigerator with the same parchment paper till use. Now roll the dough with thick center, place the butter at center and seal it properly. Roll the dough in one direction only, until 3 times the width, about 20 x 50cm. Keep edges straight and even. DON'T OVERWORK THE BUTTER STREAKS - YOU SHOULD HAVE A MARBLED EFFECT. Fold the top third down to the center, then the bottom third up and over that. Give the dough a quarter turn (to the left or right) and roll out again to three times the length. Fold as before, cover with cling film and chill for at least 20 mins before rolling to use. Roll and fold four more times, chilling after two. You can fold 4 times the previous day and then next day you can fold two times. In the whole process brush off the excess flour over the pastry dough. Chill the dough for an hour or more before using. When you feel the dough is sticky just chill in refrigerator before the next fold. You can check out this video for making the puff pastry. I tried a design and wasn't totally thrilled with it, but I'll go back to a rope design next time. In a saucepan melt butter. Add milk and water whisking until smooth consistency and JUST boiling. Cool 5-10 minutes so you don't kill the yeast. Add the sugar, salt and yeast to form a sponge like blob. Add the eggs until uniform consistency. In a mixer with a dough hook attached, combine flour and yeast mixture. Knead well. Put in refrigerator for at least several hours, but overnight is better. Roll a ball of dough the size of a golf ball into a rope and coil into a circle. Make sure the center is thinner than the outer edges to hold the filling in. Sometimes I prefer squares, but you just have to work with your dough after you have it coiled. Fill with a heaping tablespoon of filling per danish (recipe below). Let rise an hour in a warm place. Frost with Cream Cheese Frosting (see below). If you prefer a drizzle thin out this frosting with a couple extra tablespoons of milk until desired consistency. 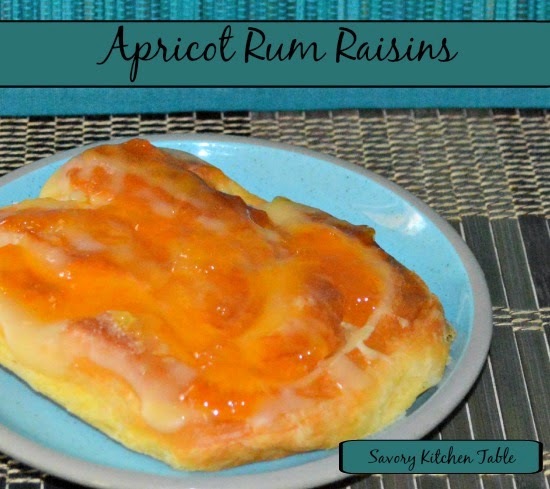 Soak apricots and raisins in rum for an hour or overnight. Blend cream cheese, egg, powdered sugar and orange peel together until smooth. Fold in apricots and raisins into the cream cheese mixture. Or my favorite is to fill them as 2 separate fillings with the cream cheese first and the apricot in the center of that. In a medium bowl beat cream cheese and butter until smooth. Add lemon juice and vanilla. Beat until blended. Add powdered sugar gradually until well blended and smooth. Ice first layer and then add 2nd cake top and ice again including sides of cake. Refrigerate 1 hour to set icing before serving. Delicious love your take on puff pastry Tamy very nice. Thank you - was really craving sweet this month! Thks for the mention n love the sweet pastry!! !